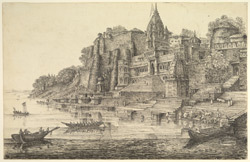 Pencil and ink drawing of bathing ghats on the river bank at Maheshwar by Sir James Abbott (1807-1896) in 1842. On the original mount is inscribed: 'From Nature by General James Abbott 1842. Ghaut or stairs to the revered memory of the Mah-ratta Princess Ahilya Bae at Mhaiswa, Nimarr. Central India, drawn from a boat in the River Narbudda'. Maheshwar is situated in Madhya Pradesh on the north bank of the River Narmada. It is a beautiful temple town which has been associated with Mahishmati, the ancient capital of King Kartivirarjun, a spectacular temple city mentioned in the Ramayana and Mahabharata epics. The city was significantly developed by the legendary Holkar queen Rani Ahilyabai of Indore (died 1795) who built a temple and fort complex here as well as several picturesque ghats which line the river banks.